Bust out your library card and celebrate National Library Week with me! This is the 2nd annual celebration on the Food Librarian blog. Sometimes, I just gotta put the Librarian in the Food Librarian! I know you are probably reading this on your own computer, but did you know that nearly 1/3 of the U.S. population over the age of 14 used the library's internet computers? As more companies only allow online applications (even if the job doesn't use computers), free internet access at the public library is one of our essential services. I hope you take some time out this week to celebrate libraries and the library staff. Libraries are special places where you can find a book, DVD, music, story time, job announcements, research assistance, and free internet access. Stop by to enjoy a seminar, join a knitting group, or get help learning about your genealogy. This is the Librarian Action Figure (modeled after real-life librarian and author Nancy Pearl). Don't laugh. How many other occupations have their own action figure?! Sadly though, the only action this librarian does is raise her arm to Shush. Sigh. Of course I start the week with a Bundt. No. Big. Surprise. I now live close to a Bristol Farms (California grocery store that is really pretty and really expensive). Last winter I picked up their free magazine. And what caught my eye? Oh, yes, the Bundt on the Cover. This bundt is easy to make and uses ricotta cheese. It is the first time I'm using ricotta in baking, and not a lasagna. Glazed with orange marmalade and filled with orange zest, this bundt is a winner. 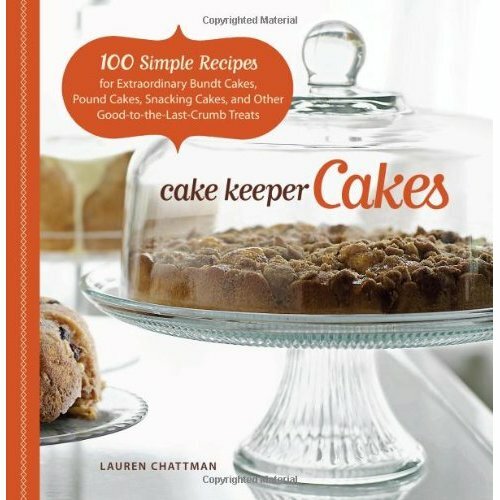 The recipe is from Lauren Chattman's book: Cake Keeper Cakes: 100 Simple Recipes for Extraordinary Bundt Cakes, Pound Cakes, Snacking Cakes and Other Good-To-The-Last-Crumb Treats... and you can win it! I'm having 5 days of giveaways during National Library Week! Get the book that has this yummy recipe. I just ordered it from Amazon and bought an extra copy for YOU! Chef Set Page Tags (purchased from Girl of All Work) Aren't these the cutest flags ever? You can decorate your cookbook with these post-it notes. To enter the Day 1 Giveaway, simply leave a comment below (one entry per person) and I'll pick the winner from a hat (aka Random). Deadline: Monday, April 19, 2010 at midnight PDT. If your comment isn't linked to a blog where I can find you, please leave your email. Shipping to U.S. addresses only. Librarian action figure not included. Find out if your library has it here. 7. With mixer on low, slowly add the flour mixture. Scrap down the sides a few times. After the last addition, mix for 30 seconds on medium speed...but don't overmix. 8. Pour batter into greased and floured (I use Pam with Flour spray) Bundt pan. Bake on the middle rack until golden brown and a toothpick comes out clean. It took my cake 55 minutes at 325 degrees. The instructions say "about 1 hour and 10 minutes" so please check early. 10. For the glaze, heat the marmalade and water in a saucepan until everything is liquid. Brush it over the cake - I used a brush to coat the entire cake, but you can also just place on top and let it run down the sides. Let glaze cool before serving. 11. Like her book suggests, keep the cake in the Cake Keeper! Since I bring mine to work, it is gone by the afternoon. I just bought this book for a fellow blogger in a cookbook swap and I loved how simple the recipes were. And that they didn't need a frosting to make them good. I would love a copy of my own! I love anything orange - this looks delicious! Thank you for the opportunity for your giveaway! Happy National Library Week to you. We are having a staff breakfast this morning. I made breaffast casserole in muffin tins, but now I wish I'd made a yummy cake. This cake looks good ! Looks yummy! Happy Nat'l Library Week! Yay! I have been looking forward to National Library week! I need to do something nice for my friendly GU librarians this week. Maybe I should bake them this cake? It looks fabulous and I have a big tub of ricotta in my fridge. I haven't been to Bristol Farms in years, but I have very fond memories of eating lunch there with my grandmother. Cake Keeper Cakes is a great book! I received it for Christmas and I love it. Thanks for the yummy looking recipe. I just bought a new bundt pan so looking forward to breaking it in! I love that you're celebrating library week! When I was in elementary and middle school I'd hang out at the library EVERY day after school. It was my second home. Also the cake looks beautiful! I love public libraries, and I would love to win that cookbook! I made the Nutella pound cake from it and it was awesome. bundts and books...two of my favorite things! Yum, this cake looks so moist and delicious! Happy National Library Week! OH, there is a Bundt involved. I am in. Ricotta is just great in cakes and this one looks very yummy. I was also going to ask you about the National Bundt cake day. Will you feature one month of new Bundt cakes again? I know it is still some month away but I just loved it so much last year. Yea for Librarians and Libraries! This cake looks amazing! Pound cake and marmalade, what a combo. I can't enter because I'm in the UK, but I just wanted to say how much I love that there's a librarian action figure! :) I use our local library constantly, I must have borrowed all of their cookbooks over the last few months. Your cake looks gorgeous, I don't know why we don't see many bundt cakes over here, they're so much prettier than a regular round or square cake. One of my FAVORITE places to go is the library. I am like a kid in a candy store. My brother exclusively uses the library for his internet access. Who knew he was one of so many. Happy library week! I heart my library big time. My daughter and I have both been sick this past week and I've sent my husband there to fetch books and movies at least 4 times this past week. That cake looks scrumptious, even though I am not a fan of ricotta. Whenever I am supposed to use ricotta, I swap it out for small curd cottage cheese. Do you think that would work in this cake? I've got two librarians for sisters. National Library Week is big! looks wonderful! i would love to work at a library...i love books more than anything! I love your giveaways and library week! It is so fun. I also love that librarian figurine- so cool! I would love to win a copy of this book. I have it flagged at my local library but they haven't got a copy yet. What a gorgeous cake, and that book sounds fantastic. mmm, that looks delicious. and i love your use of the library action figure. i have a jane austen action figure in my office. she has a sweet writing desk. i hope you enjoy this special week! Love the cake and I love the library:) I go every Friday! as a future librarian and amateur baker, your blog is one of my favorites! i will definitely try this bundt! i need to get me a bundt pan because that sounds delicious! i generally use ricotta in pancakes and love the added airy fluffiness it gives! Yay! Cake and giveaway! It is like a party! I just found your blog last week when I was looking for new recipes to feed my bundt addiction. Thanks for the inspiration! Beautiful! Is this a favorite bundt? That bundt looks fantastic. I am making more bundts these days. They are so easy and they don't need FROSTING!!! All of yours are wonderful. Keep it up. L.O.V.E. the librarian action figure! and the little flags. Although, knowing myself, I would only use the dessert ones! Love the bundt too! I'm making one this weekend! I love the idea of this cookbook! It's always annoying when a beautiful cake ends up stale. I'm happy to celebrate librarians, and libraroes, and you. My life is immeasurably enriched by all three. (BTW, I was a librarian in college - kind of sort of - for a small private collection and my favorite thing about it was that the card catalog was handwritten and I got to file my penmanship with some very very old entries! I love my local library! My library card practically has holes in from all of the use. Oh, and lovely bundt! I am a librarian and work with many more - happy national library week! Your cake looks amazing. I've never baked something sweet with ricotta too. I need to go buy some ricotta now. Happy National Library week! I love libraries. I spent most of my childhood in libraries reading books, checking out books, doing the summer reading program. There's this quote written in front of my local library back home that is one of my favorites of all time, I don't know if you've come across it: "I have always imagined that Paradise will be a kind of library. ~Jorge Luis Borges"
That bundt looks amazing! I recently canned a bunch of marmalade so this will be a great way to put it to use. That cake cookbook is something I will definitely be checking out soon! I love my local branch. They are small but very active and so helpful and nice. This is a lovely give-away. I'm a librarian and baker. I would love to try some of the recipes in the book. Hi Mary- Happy library week! As the proud sister of a librarian (and a happy library patron), I'm feeling the love. Also the love of bundt cakes-- I made the Greek yogurt lemon one for Easter this year. Pretty and delicious! I really enjoy your blog! Bring on those Bundt cakes!!! Thats an awesome looking bundt! This bundt has some serious flavor in it! Love the orange infusion. Citrus just goes so well in bundts! Delicious looking cake and Happy Library Week to you. Hope you are having a big librarian party! I don't know how I would have gotten through high school without library computers. And that bundt cake looks soooo good. I could use a nice cake cookbook, too :) Happy library week! I love that book, the recipes are so reliable and being obsessed with Bundt Cakes it's just perfect. I made this awhile ago but swapped the ricotta for buttermilk and added some dried cranberries http://www.flickr.com/photos/lisa_c/4308552974/) I'm sure using ricotta would probably have made for a richer cake, but it was tasty anyway. this is so attractive and so SPRING! i've never used ricotta in a pound cake, but it's a terrific idea. I have never used ricotta in a cake or anything that I baked other than lasagna either. I can't wait to try it. Thanks for the recipe, the yummy pictures, and the giveaway. I'm in charge of distributing 42 lbs of candy at my library for national library week. I'd much rather eat a piece of this cake instead. Can you send cake with the cookbook pretty please? I'd love to celebrate National Library Week with a new cookbook! I love Bundts and libraries! Oooh that cake looks wonderful! And is there anything better with National Library Week than cake? No! You post reminded me that I have an overdue book laying on my nightstand. I better get myself to the library to return it! Yikes! You're amazing! A true librarian superhero indeed. Not only do I love cake, libraries, and labels, I'm now inspired to celebrate National Library Week with appropriate fanfare. I think I will go on a feltboard making marathon. Yum! Love reading your blog! Whoa! You mean it's been a whole year since we've seen the librarian action figure?! I can't believe that. It's great to see her, though! The cake looks awesome, Mary...as usual! I already own the Nancy Pearl action figure (and have met Nancy Pearl in Milwaukee where she was speaking)so that would be perfect with the recipe. I got a cake keeper for my birthday last year, and I need new things to fill it up! Mary, you most definitely becoming my Bundt Guru! And how generous of you to give away the cookbook! Yeaaaa!! I remember these giveaways and the librarian miniature last year!! Wow, I've been following you for a long time. the bundt looks beautiful! every time I make a bundt cake I think of you. I'm loving this giveaway AND I love that my local library system carries SO many good cookbooks. I don't think most people know you can check out a cookbook. The library has EVERYTHING! I can't believe that I have been following you for a year! Thanks for the recipes and musings! Happy National Library Week! So after your 30 days of bundts last fall, I asked for a bundt pan for Christmas. And of course one of the first recipes I tried was one from the 30 days: Chocolate marbled banana bundt cake. It was delicious! This cake is certainly wonderful, just the list of ingredients makes me drool; ricotta adds a lot of moistness and the orange does the rest! That cake looks yum! :) I think I'm craving it now lol. I've been staring at that bundt cake for 10 minutes...it looks fantastic and I think I need to make one this week. I have been drooling over this ricotta bundt cake since I saw it this afternoon...I LOVE ricotta, and I think I need to make this cake...and I think I need this book too, which I'd love to win a copy =P but it's going on my amazon wish list regardless...thanks for stopping by my blog, let me know how the energy bars turn out if you get a chance to make them. They've been very tasty and hit the spot for a mid-afternoon snack to curb the hunger without being too filling. Have a happy National Library Week! I heart my local public library branch--it's got the biggest cookbook section I've ever seen in my life! I love the texture and rise on that bundt! I'm not a huge marmalade fan but I'd give this a try. This cake look so beautiful, also count me in the draw. Now you are all ready for the next 30 days of bundt! Happy National Library Week!! This cake looks phenomenal. Love the zest curls! OOOOOOoooh! That looks yummy! Always looking for new recipe to use up my ricotta. Thanks for sharing an the giveaway too! This looks great. Perfect for a Sunday brunch! This is the best giveaway ever I would love to win! I love the action figure! So cute. I followed your month of bundt cakes last year; I don't know how you kept it up for a whole month as that's a LOT of cake! This bundt looks delicious. I've been looking for cake recipes that use ricotta or mascarpone so I can figure out how to adapt their use to other cake and bar recipes. The cookbook looks wonderful..I love cakes showcased in pretty cake stands. 2 things: 1. the cake looks INCREDIBLE! 2. Those chef tags are genius. I need some! Well, as if I really need them, but I just really want them now. Happy Library Week. The Bundt looks great! (Drooling!) Sounds and looks sooo good! That looks yummy! I've never used Ricotta in baking, but I think I'm gonna have to try it! I can't enter the giveaway because I'm in Canada, but I wanted to let you know that I made this fantastic cake today - I can barely breathe, it looks so divine, LOL. I posted a photo on my cooking blog - thank you SO MUCH, Mary, for posting this amazing cake - I can't wait for supper so I can have a taste, LOL!! Good luck to everyone in the contest! This looks wonderful! Ricotta is so versatile. I love the library. I live less than a mile from my local branch and I walk there as much as I can. I'm there at least a few times a month. Go, librarians! ricotta orange bundt? yum yum! Happy librarian week! I was thinking of baking something for the library workers at my local library. Who knew this week would be perfect for that?? Thanks for letting us know. The bundt cake looks amazing. I'm sure you could make it with cream cheese, but ricotta sounds soooo much better. Those page markers sound like a great way to keep recipes oraganized. YUM! your recipes are always so tasty. love them! This looks delicious! I love reading your blog! I think I love bundts as much as you! While this one looks great, I'm so anti-ricotta I don't think I could make it. The book however, that I would definetly like! Amazing bundt! Keep up with the updates! Keep those big bundts coming! Thanks for the giveaway! I love to bake and I am a librarian. Happy School Library Month and Happy National Library Week. Aloha. I love libraries (and librarians), loved the 30-days of bundts, and I'm looking forward to trying this ricotta recipe. That cookbook looks great! Love cakes that are complete all by themselves without adding frosting. This one looks oh so delicious! That cake looks delicious. I especially like the little zesties on top! I love using ricotta in baking, I'll have to give this recipe a try! I LOVE the librarian action figures. National Library week sounds great, wonder if we have one of those over here too? Another baking librarian here to say YUM! The cake looks awesome. I have never heard a ricotta cheese in a cake recipe before. I guess you learn something new everyday. The recipe looks good and I will try it. I don't know about using ricotta, but I have been making a chocolate cookie recipe using cottage cheese for many years that’s wonderful. Maybe it could be substituted. Great ideas -- I'm graduating library school next month and you've just given me a terrific idea for my cake!!! As a recently retired library director, I am thrilled to have found this blog. While I was working I tried to cook at least one new recipe a week, now I can attempt one a day. I just happen to have ricotta in the refrigerator. I also have a Nancy Pearl action figure. This is wonderful, I can finally get rid off the ricotta my roommate left in the fridge when she went back home! Just found your site and LOVE it! I'll be back! I love bundt cakes! Great giveaway! I'm an elementary school library media specialist. I've been having activities for students to celebrate School Library Month and National Library Week. The bundt cake sounds like a nice treat for teachers! Thanks for the recipe! here in Brazil we celebrate librarian's day at march 12! That cake and your photos are totally drool-worthy. Thanks for your blog, I enjoy it so much! Oh lucky day! (...now that I've found this website!) Wow! Your blog is inspirational. We all need a nice treat such as you provide. Thanks. My library has that same Nancy Pearl action figue. The kids always ask me why I have a guy picking his nose. Mmm, this cake looks delish. I need a bundt pan NOW! I love the library and I love your blog. This cake looks really yummy. Would love to win the cookbook. Been making homemade cakes for special occasions in the past year. Wow, the glaze on this bundt looks perfect! I love anything with citrus zest so this looks fabulous. It also has a "spring" appeal! This looks really good! I love bundt cakes too! I will have to make this cake in secret though because the hubble won't touch it if I tell him there's ricotta in it. We'll see if he notices! LOL! Cake Keeper Cakes has been on my amazon wishlist for ever! Wow, you are going to pick a lot from a hat! I want to win! Gorgeous bundt. I love libraries and always use them. Why pay when you can read for free??? This cake looks delicious. Thanks for the great giveaway! I love making cakes in bundt form. I love baking with ricotta. Your cake is a beauty. what a gorgeous looking bundt! i've been on a citrus dessert kick, and this is definitely up my alley. One of the best pound cakes I have tried! Thanks for sharing this recipe. I have tried making this last night for a little house warming party, and it was definitely at hit during our dessert. It went really well with a cup of hot coffee made from one of my coffeemakers Great post and thanks for sharing ! I just made this yesterday for an event at work. It's pretty good, but even better the second day. Also, I should have checked it at 1 hour, an hour 10 minutes was just a bit too long.